This page contains the Pokedex Data for Golbat, including base stats, type defenses, abilities, evolutions, move list and location in the games. Inner Focus Inner Focus prevents Golbat from flinching if hit with attacks such as Heabutt, Bite, Crunch, and etc. 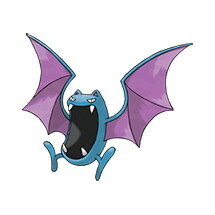 Infiltrator Golbat ignores the effects of Reflect, Light Screen, and Safeguard.